My room is in the size of medium in which I have a wooden bed and now I have lightened my room with pink colour (light pink) and I want something to try different. So I request you to prefer me a good colour so that it should give a soothing effect. Hello Priya and thank you for writing in. I think that the best colour to put with pale pink for a relaxing look in a bedroom would be silver. I don't mean necessarily a shiny silver but a soft silvery grey would be beautiful but still gentle and suitable for a bedroom. If that doesn't appeal there is always white, of course, which would look good - and would make the pink even pinker if you see what I mean. 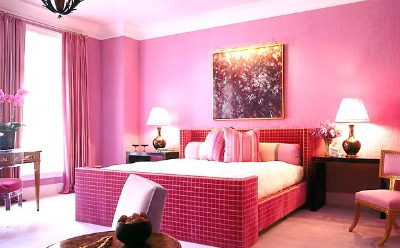 Personally, I very much like dark navy blue with pink but you may find that too strong for a bedroom. One final thought - another colour that goes well with pink is... more pink!